Washington (CNN) - Most Americans say that the U.S. does not have a responsibility to do something about the fighting in Syria, although the number calling for U.S. action in that country has grown from 25% in February to 33% now, according to a new national poll. According to a CNN/ORC International poll released Wednesday, six in ten continue to oppose any American intervention to halt the fighting between government and anti-government forces in Syria. "That pattern matches the public's response to similar situations in the past," says CNN Polling Director Keating Holland. "In March of 2011, only 27% said the U.S. had any responsibility to intervene in Libya, even though the bad guy - Moammar Gadhafi - was fairly well known to Americans and many prominent politicians were calling for some kind of response, mostly in the form of a no-fly zone." The belief that Syria is not the responsibility of the U.S. crosses party lines in the survey - 57% of Democrats and 58% of Republicans say the U.S. should take no role. Gender sometimes plays a role in public opinion of foreign issues, but in this instance, men and women agree, with 61% in each group saying that the U.S. has no responsibility to take any action in Syria. 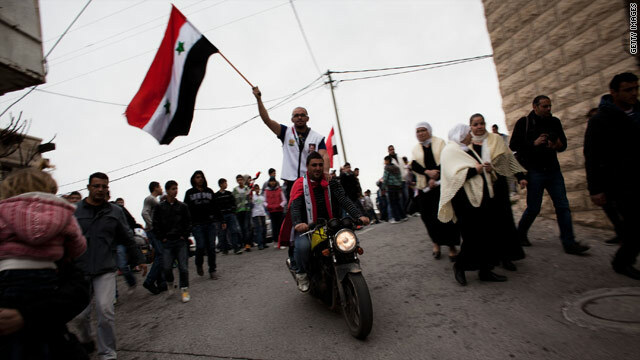 The crisis in Syria began nearly 15 months ago, when a tough government crackdown on protesters spiraled out of control and spawned a national anti-government uprising. Secretary of State Hillary Clinton, meeting with world leaders in Turkey Wednesday to discuss Syria, said the U.S. and its allies were working to halt financial assistance to Syrian President Bashal al-Assad's regime. "We must continue to close off the regime's economic lifelines, expand the circle of countries vigorously implementing sanctions, and prevent the Syrian government from evading them," Clinton said in a statement. We're broke,remember? We don't have the money to help ourselves. The unhinged GOBP wants to start wars all over the the globe to line their pockets.